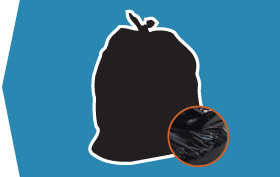 Compactor bags are thicker than the average trash bag to help withstand mechanized pressure from machines that compact and compress the bag's contents. So even though the trash that is being put in a compactor may not be so heavy or sharp, the liner must be thick enough to withstand the pressure. Our Compactor Bags are available in a range of sizes and thicknesses to fit the compactor you have. Proudly made in the USA!